Although I have written recently more about the Eurocrisis and economic policy, I still follow the Finnish/European paper industry with interest. In this short analysis I would like to present some thoughts about the Finnish pulp market, its actors and its possible development. In a way, this analysis is an exhibition of how economic sociology, and how it understands markets, may be valuable for firms as well. First, about price formation – I wrote about that topic before, in 2012, with regard to the price increases in softwood pulp. The news from Finland (Helsingin Sanomat 30.10.2014) right now is that Finnish forest-owners’ lobbying organisation MTK demands price hikes to the price of pulpwood, arguing that the price of pulpwood has declined by some 40% since 2000, while the pulp industry has performed well. Although the price of pulp is set in markets, the price of pulpwood is like a brainwave during coma. In other words: he, as the representative of the lobbying organisation, is not happy. And it is true that the pulp markets have been quite good, recently at least the pulp divisions of major Finnish forest industry firms have performed well (whether that will last with a slow-down of China is another question). It is telling that the article mentions that there are about 300.000 forest owners but there are only four pulpwood buyers: Metsä Group, StoraEnso, UPM and Harvestia. For logs there are many buyers, since there are quite many saw mills still in Finland. The manager of wood acquisition who is speaking here then goes on to list many factors which influence the final price effect of the storm. Of course, one can dress this up as a question of supply and demand, but in a situation with only a few buyers this is rather more like a negotiation situation – as I emphasised in the older article ‘It should not be particularly difficult to get the market to accept the price increase, they said.’ – but in this case it would be what kind of lower offer would be agreed upon. 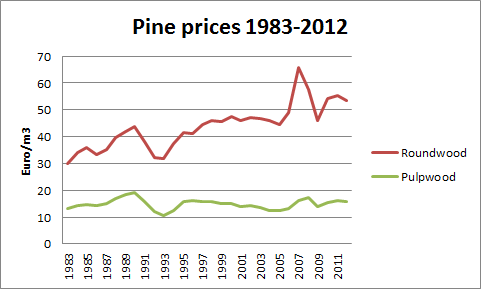 For simplicity I only present the price development (euro/cubic metre) for pine. I now also disregard all kinds of quality requirements regarding what is suitable for sawmills and for pulp mills. Although 2010 and 2011 saw damaging storms in Finland, prices did not change very much. The decline in prices between 2007 and 2009 more likely had to do with the emerging economic crisis in Europe. Although there is probably a way to argue the same thing through econometrics, I have the feeling that part of the relative success (and in the early euro era, until about 2005, the substantial profits) of the Finnish pulp and paper industries is also due to the quite constant price of pulpwood (at least for pine). And regarding market organization – I did not find statistics on the import of pulp wood to Finland but Finland does import significant amounts of pulp. The Finnish Statistical Yearbook of Forestry also mentions the cost structure of the pulp and paper industry in comparison with the wood-products industry, and the fraction of wood raw material for the latter is indeed nearly twice that of the pulp and paper industry, which should not come as a surprise in the light of the picture above. In addition, total profit as a percentage of the total turnover is much smaller in the wood-products industry. So, in conclusion, it can be understoon why the lobbying organisation is demanding hikes in pulpwood prices. The problem nonetheless is, seen from how the market is organized: why should the Finnish pulp and paper industry firms care about this demand? After all, they are more or less in a position to negotiate the prices that suit them, or even replace domestic pulp by foreing pulp. The organization of the market can then be seen as a key factor in the price developments of pulp wood. The fact that the article in Helsingin Sanomat mentions that the organization of membership in the lobbying organization changes (not anymore mandatory) may even have the effect of downward pressure on prices, as the buyers may even have more scope to play off different sellers against each other. Both in my dissertation articles and on this blog I have discussed the merits of product- versus process innovation. Finland is in such a location, that its industry can’t be just as good as Germany’s or Japan’s, no, it actually has to be better, because between Finland and most of its markets there is a barrier which increases price: the Baltic Sea. Now, Finnish export industries, including their trade unions, have complained a lot about the Sulphur Directive, as it would add an unfair extra cost on Finnish exports (from 2015). As I’d like to say: yes, that is true, but the time used to complain about this issue also could have been used to gear up for changes. And beyond that, the Finnish state also has instated a compensation program. On top of that, Wärtsilä is doing great business with retrofitting sulphur-washers to older ships. And, let’s not forget that Finland has the great potential of developing sulphur-free biofuels based on processes in the pulp- and paper industry. Admittedly, this is still in baby shoes, but right now, with nearly free money from banks due to zero interest rates (nearly) the industry should throw a lot of money on this issue, as this is a sure source of demand in the years to come, in contrast to paperboard markets, which may at some point in the near future (especially regarding China’s slowdown) reach a saturation point and then the whole overcapacity drama will play out all over again. The biofuel issue is one of product innovation, and Finland can and should be a leader in that field – all Finnish forest industries have pilot plants and bigger refinery plans in various stages of completion. Product innovation in the sense of intelligent paper etc. is probably going on as well, but I do not know how scaleable these products would be and how popular they would be. Things like packaging that announces when food goes bad sound great, but for the end-seller (i.e. shops) they might be a cost which is too high relative to benefits. But we have to see about that. The issue of process innovation has been very important in the Finnish paper industry. Due to process innovation, labour productivity has greatly increased over the years. As a besides, which is a well-known phenomena, labour productivity growth has both benefits and drawbacks, both for employees and employers. It is obvious that greater labour productivity enables the final product to be cheaper, but depending on market demand, rising labour productivity might endanger jobs at the site (after all, less personnel would be needed to produce the same amount of product). Furthermore, especially in the Finnish context with its high local unionization rate, labour productivity increases have also led to wage increases. These have been justified for many years, as long as markets grew. Currently, however, high labour productivity and low demand make for a problematic combination. In the Finnish legal (and labour market relations) context, the only way to combine these facts is to shed labour – it is near impossible to be flexible on wages. This kind of rationalization has its own risks – firms are very vulnerable to sickness absence and chronic understaffing also increases the risk of sickness absence. Thus, in terms of labour, labour productivity increases are not quite always positive, especially because at the moment employers would not increase wages along with productivity, because the market situation is so weak. Enter university-led innovation. A recent report on Tekniikka ja talous discusses an innovation by the research team of Tapani Vuorinen of the Aalto University. Short and simple, the innovation is a much faster way to bleach pulp. The article mentions that the process would be 100.000 times faster than the traditional process. This means that also labour productivity would greatly increase, and thus the labour costs of making paper could drop. The article mentions that this new method would be commercially available in about three years and it would need only small investments. Again, with the availability and price of credit as it is, a no-brainer I’d think. Professor Vuorinen also states that this method would have positive impact on the environment, because it would not be necessary to cook pulp as long as currently needed. Once more it goes to show that industries and research related to the paper and pulp industry can foster important innovations, and with environmentally sound results even. Tekniikka&talous rapportoi tästä myös, mikäli ei halua lukea englanninkielistä tekstiä. Olen aika innostunut tästä – tässä on taas esimerkki, miten metsäteollisuus voi tuottaa innovatiivisia tulevaisuuden tuotteet! Sellubisnes edelleen kannattaa. Valmet näyttää, että laatu on tärkeämpi kuin edullinen hinta – Suomen kilpailuvaltti on laatu, ei pohjahinta. Vaan hyvällä hinnalla saa hyvän tuotteen.